The RP Photonics Buyer's Guide contains 9 suppliers for tapered fibers. 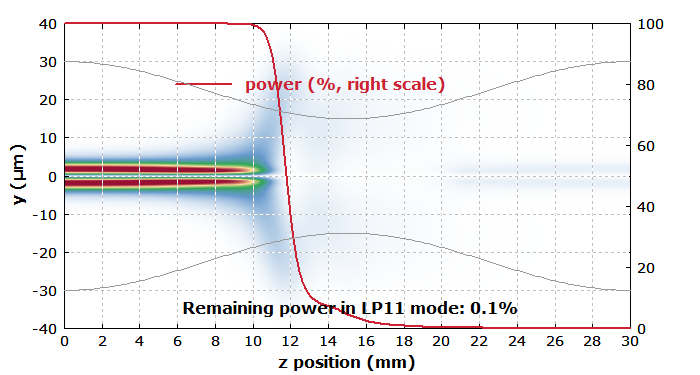 The software RP Fiber Power can be used for analyzing tapered fibers with numerical beam propagation, where the refractive index profile may be z-dependent. See a nice case study! A tapered fiber can be produced by gently stretching an optical fiber while it is heated e.g. over a flame, such that the glass becomes soft. This procedure makes the fiber thinner over some length of e.g. a few millimeters or centimeters. The fiber core also gets thinner by the same factor as the total fiber. Moderate tapers are sometimes used for the purpose of mode matching: it is possible, e.g., to reduce the mode area for one end of a standard single-mode fiber in order to achieve an improved coupling to some small-area waveguide (→ mode size converters). Another application is mode filtering: the higher-order guided modes become quite weakly guided or disappear completely in a moderately stretched fiber region, so that largely only light in the fundamental fiber mode remains. 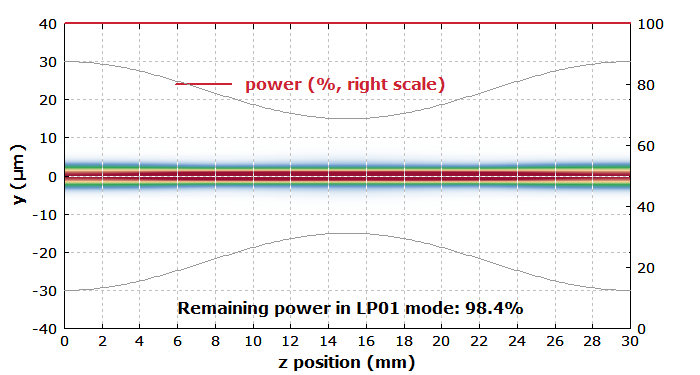 Figure 1 shows how light in the LP11 mode is completely lost in the tapered region, whereas light in the fundamental mode (see Figure 2) hardly experiences any losses and even does not undergo a substantial change of mode size (for the chosen parameters). Figure 1: Amplitude distribution of light along a tapered fiber for launching into the LP11 mode. In the thinned region, the LP11 mode does not exist, and the corresponding light gets into the cladding. 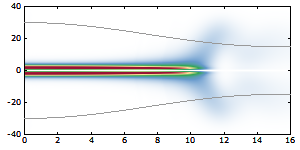 This numerical beam propagation simulation has been done with the software RP Fiber Power. Figure 2: Amplitude distribution for launching in the fundamental mode (LP01). It is also possible to perform stronger tapering, as shown in Figure 3, where the diameter of the tapered fiber region can be only a few microns over a length of a few centimeters (or even longer than 10 cm). Under these conditions, the original fiber core becomes so small that it has no significant influence any more, and the light is guided only by the air–glass interface. Provided that the transition regions from the full fiber diameter to the small waist and back again are sufficiently smooth, essentially all the launched light can propagate in the taper region and (more surprisingly) find its way back into the core of the subsequent full-size fiber region. Figure 3: A glass fiber which is strongly tapered over some length. It has been demonstrated that with somewhat refined tapering techniques (involving indirect heating of the glass via a sapphire taper or a sapphire capillary) it is possible to carry out even very extreme tapering, leading to nanofibers with diameters of a few hundred nanometers or sometimes even well below 100 nm. If two or more fibers are heated over a flame, they may form a common taper region. That configuration is often used in fiber couplers. Here, some of the light launched into one fiber can couple over to the other fiber, but only into a mode with the same propagation direction – it is a directional coupler. If the parameters of the original fibers are somewhat different, a null coupler may result, where light launched into one fiber will emerge only from the corresponding end, and coupling occurs only e.g. under the influence of a sound wave propagating in the taper region. Tapered fibers with few-micron taper regions are interesting for a number of applications, such as supercontinuum generation, fiber-optic sensors, or acousto-optic fiber modulators.